Kindergarten Registration is coming soon! 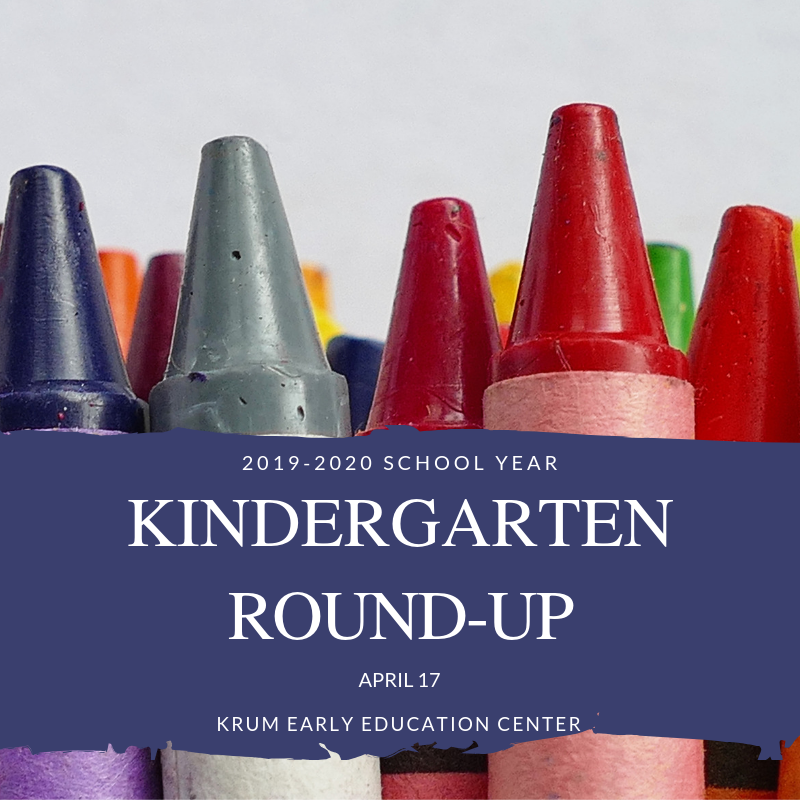 Krum ISD will be hosting the 2019-2020 Kindergarten Round-Up Wednesday, April 17th from 8 a.m. to 5 p.m. at the Early Education Center. Your kindergarten student must be five years of age as of September 1, 2019 to register for the 2019-2020 school year. Early registration is recommended to assist the school in allocating classroom space and ensuring appropriate staffing. If you are unable to register at the designated time, please contact the EEC regarding additional registration opportunities. For more information, you can contact Bobi Lackey at 940-482-2605 or email bobi.lackey@krumisd.net. Proof of residency documents. Acceptable documents include: notarized statement of residency form stating that family is living with a KISD resident along with the residents proof of residency; tax statement on a home; utility bill; lease agreement; closing documents on a home. Immunization records. If you have proof that you are coming from another Texas school, we can request it from the previous school district. If this is the first time the student is attending school, or if the student is coming from out of state, this information must be provided. 2 forms of identification for student. Acceptable forms include: original birth certificate; passport; report card from previous school; social security card; military ID; hospital birth record; or adoption records. *To download the forms, your computer will need Adobe Reader. Click here to download the latest version of this program. Before printing, check all fields to make sure no text or numbers are cut off. If this does occur, clear only the fields that are affected and fill them out after printing. The purpose of the Krum ISD Dual Language Program is to to improve the academic success of both Spanish and English dominant students while closing the achievement gap between the two groups. Students enrolled in the rigorous and academically challenging program will develop skills in both Spanish and English, resulting in bi-literate students at the end of fifth-grade so that students graduate ready for college, career, and life in a globally competitive economy. All children who are in the program will be taught to read in their first language. They will later transfer that information into a new language. All students in the program will be taught math in English and science and social studies in Spanish. Students participating in dual language programs close the achievement gap that currently exists between English Language Learners and general education students. Students in dual language programs develop respect for multiple cultural heritages. Students' cognitive function is positively impacted when they learn a second language. Students in dual language programs increase their marketable skills in a global society. Parents who are interested in enrolling their student in the KISD Dual Language Program are asked to commit to the program through the fifth-grade year in order to maximize academic performance and language acquisition in two languages. Due to the anticipated popularity of the program, there will be limited space to accommodate students, with first preference given to those who are eligible due to a need for bilingual education services. Our dual language program will serve as our bilingual program for state requirements; therefore, students who are not eligible under the LPAC must attend two informational parent meetings at the EEC campus in order for their child to be eligible. The Dual Language Overview meeting scheduled for Tuesday, April 30th at 6:00 p.m. is for those interested in placing your child in the kindergarten dual language program next school year. This is just an informational meeting for those interested. There will be a mandatory parent meeting for those new to dual language that will be held at the EEC on Saturday, May 4th from 9:00-11:00 am. If you already have a child in the program, you do not need to attend. This will be for parents new to dual language. All applications for students coming into the program for the 2019-2020 school year are due May 17th.